Time for a long due update. The last month I got back into some old school sea kayaking again in the sea of Kattegat. On the first trip my training mate Morten and I borrowed a sea kayak K2(Tahe Marine Reval Duo) from a local club. Using a trolley we got the kayak and gear on the ferry to Varberg. Arriving in Sweden at 5 in the morning, we launched at a nearby beach in cold, misty and calm conditions. This was quite a different sea kayak trip. Our entire setup concerning clothing, gear and speed was not very sea kayak'ish but more like the first day of the Tour de Gudenaa race. That is full speed ahead and only short breaks. Pauses had to be short anyway as we would start getting cold otherwise wearing but thin training outfits. We got to Anholt fast though we were cold and hungry at arrival. My K1 sprayskirt leaked like a sieve resulting in 25 l of water in the boat - calm conditions notwithstanding. The next day the wind had increased and we decided to use the ferry back to Denmark. For once I had to quit a trip because of lack of gear. In hindsight this was clearly a rather ill-prepared trip. We had never used the kayak before or even paddled a sea-K2. I was too tall for the kayak so the mounted backband dug into my lower back resulting in some nasty wounds. We only had one proper sea kayak sprayskirt, no pump, wore clothings fit for racing at a sheltered lake and not for the ocean, the food was a mess stored in random places and so on. Still we had good fun and will definitely have another go at one point. The second trip was done further north in partly quite windy conditions along with a very good friend of mine. This was an entirely different setup with proper tested gear, lots of experience and better preparations. 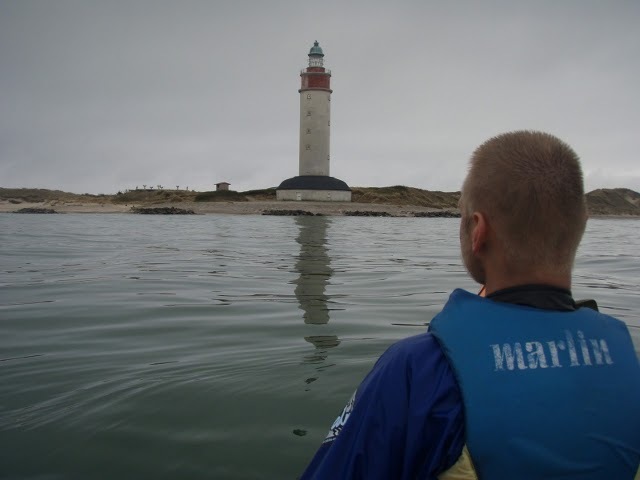 Launching from Frederikshavn, we paddled to the island Læsø on the first day. While this was my first kayak trip to Læsø it will certainly not be my last. Great beaches and only few houses on the northern coast. 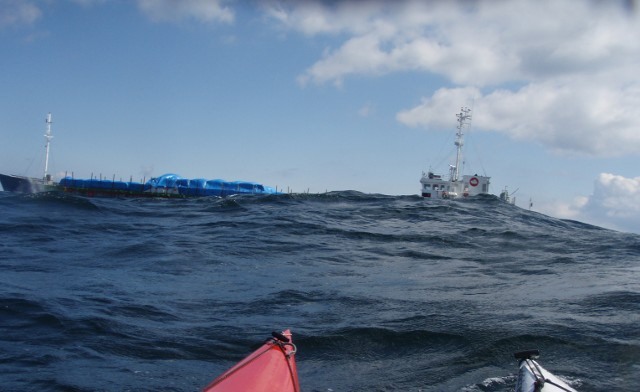 The next day we did the 40 km crossing to Sweden in a force 6 following wind and sunny weather. Big waves but too chaotic for good surfing. We first reached the small rock Hallands Svarteskär some kilometers of the mainland. It was quite the sight watching the big waves smashing the rocks in the sunshine. The reward of the crossing was the wonderful archipelago south of Gothenburg. The next day we made our way to the north and to the ferry berth where we caught our transportation back to Frederikshavn. Halfway between Læsø and Sweden. Two very different but super nice trips in the sea of Kattegat. It was great going with strong and positive thinking paddlers and it was good to be reminded that I still love sea kayaking and that my usual K1 paddling builds a nice foundation for other kayak disciplines. Really nice to see that you are back again!!! I wonder if you can help me to promote our upcoming race in Sweden, Seamasters & Swedish Surfski Championships, on July 30-31. What do we have to offer to make the event interesting? Peter U: Could you also update us with latest information on the Danish Downwind 2010 race? Peter E: There are two events taking place at Nordic countries at the same time, the Seamasters and the ASKR. One has to make a choice. And then there is the question of transporting your own surfski vs. renting one. Last year I was interested in participating the Seamasters, so I sent email to one of the organizers of the race, Erik Wallgren of Nomado who sells Epic surfskis, asking if it would be possible to rent a ski. He responded, telling that there might be surfskis available for rental, but that he would have to check if he can find a ski for me. I never heard of him again, so I participated a local event in Finland (no downwind, unfortunately) instead. I'll get back to you with an answer sunday or monday .